When I deliver my medical emergencies course I go through the emergency drugs in the dental practice or general practice, ensuring that every member of the team is involved in the discussion and gets an opportunity to handle the equipment. One of my most common questions is:- “can I give that to the patient?” I always aim to make sure that every member of the team understands their professional limits as there are emergency drugs that are prescription only. A full list of the drugs expected to be held in practice can be found here. Below is a list indicating the conditions that each of these drugs is indicated for and then details on who can administer them. So who can administer the drugs? – should be prescribed, however in an emergency it is appropriate to give high flow oxygen, via a non-rebreath mask, without delay whilst waiting for help to arrive. – is exempt under the Medicines Act 1968 and can therefore be used by anyone who is able to recognise life threatening anaphylaxis and administer it either using an auto-injector or as an intra-muscular injection. This can be repeated at 5 minute intervals if necessary whilst waiting for help to arrive. – is a prescription only medicine. If a patient has taken it before but has not got theirs with them then it’s appropriate to offer the emergency stock. – is a prescription only medicine. If a patient has taken it before but has not got theirs with them then it’s appropriate to offer the emergency stock. This can be repeated at 5 minute intervals whilst waiting for help to arrive. – is an over the counter (OTC) medicine. It can therefore be offered to a patient suspected of having a heart attack (myocardial infarction). Be aware of patients who are allergic to aspirin and do not give it, always check with the patient. Also patients who are on Warfarin or with a history of gastric ulcer may be reluctant to take it; if this is the case let the paramedics discuss it with them. This is a once only dose. – is a prescription only medicine. This should only be used by the Dentist/GP or under their supervision. It should only be used if the fit lasts longer than 5 (timed) minutes whilst waiting for help to arrive. – if someone is suffering from hypoglycaemia then 10-20g of glucose is required this is either 2 teaspoons of sugar, 3 sugar lumps or a tube of Glucogel and repeated if necessary whilst waiting for help to arrive. – is a prescription only medicine. It can be purchased as ‘Glucagen – Hypokit’ by Novo Nordisk which is exempt from being prescription only if given in an emergency with the purpose to save life. 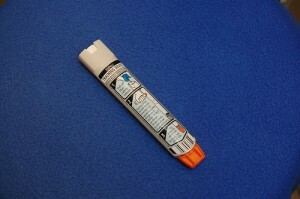 I have struggled to get a definitive answer but the BNF states that the ‘Prescription only’ restriction does not apply where administration is for saving life in emergency, however my opinion is that hypoglycaemia would need to be confirmed, using a glucometer, to ensure this is given appropriately. This is a once only medication. I hope you found this useful. If you would like more information or to book a medical emergencies course then please contact us.